Come to the MREA Headquarters in Custer, WI for just one week, and receive all the training you need to prepare you for the NABCEP PV Associate Exam. The NABCEP PV Associate Program recognizes individuals who have demonstrated knowledge of the fundamental principles of the application, design, installation, and operation of Photovoltaic energy systems. A NABCEP Associate Credential is earned by passing an examination based on the related NABCEP Associate Job Task Analysis (JTA) or Learning Objectives. We’re hosting a series of courses that will qualify you to sit for the NABCEP PV Associate Exam upon completion. Topics include photovoltaic (PV) fundamentals, PV site assessment practices, and design principles and considerations. We’re offering this in-person course progression in the spring, summer, and fall of 2019. Camping is available for students onsite at the MREA Headquarters in Custer, WI for just $20 a night. If you have no prior training or experience, you’re the perfect candidate! There are no prerequisites; just come eager to learn. 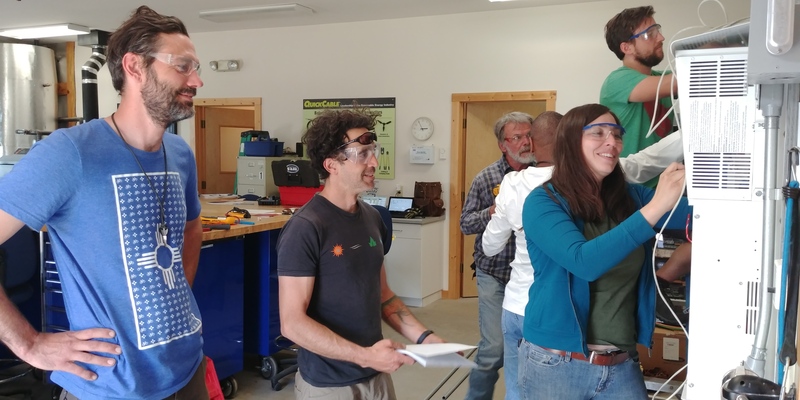 Your instructors are experts in the field, and their knowledge, experience, and enthusiasm will motivate you to begin (or expand) your solar career. If you register for PV 101, PV 201, and PV 202, you can take PV Exam Prep for FREE! Just enter discount code: freeexamprep upon checkout. MREA Members receive $20 off each course registration. Join today! The MREA is approved by the Wisconsin State Approving Agency (SAA) for GI Bill® education benefits. NABCEP PV Associate Exam – Students may sit for the exam on May 10, from 3:00-5:00 p.m.